I just received my advance copy of Betsy Greer's new book Knitting For Good in the mail this week. It's so awesome. I read it a bit back, but holding your friends finished book in your hands makes you feel so proud, especially when the books message is so empowering and positive. I'm also excited because on the back there is my very first printed endorsement, so very official! Yesterday Cortney and I spent the day at the Midwest Express Convention Center at the Fine Furnishings & Fine Craft Show. It was a strange experience since it was a really straight forward show. The organizer Karla had read my article in the NY Times and invited us to be a part of the program which was really nice. Both Cortney and I brought sewing projects and mostly just chatted with each other. We did meet a handful of nice folks and sold a few copies of the book too. myloveforyou Handmade Nation Book giveaway! Make sure to spend some time on this blog, it rules! This evening Cortney & I finally had a second to put together packages for the contributors to our book that just came out. Here we are signing the first copies!!!! Today our good friend Kate Bingaman-Burt who is the illustrator for our book sent over the most lovely set of photos of the book.... here are a few but check out the set HERE. This weekend we are Chicago bound! Guess what.....we are going to have the book for sale for the very first time!!!! AND and and the brand new Handmade Nation pattern that Kate Bingaman-Burt illustrated and Sublime Stitching is releasing!! 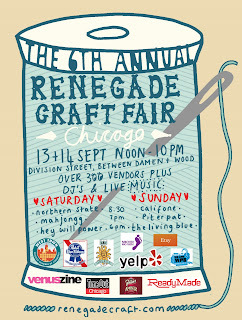 Find us at Renegade Craft fair, booth #3! Somehow, I forgot to post this article from the New York Times last Thursday...... It has been a pretty nutsy week. The link to the article is HERE. 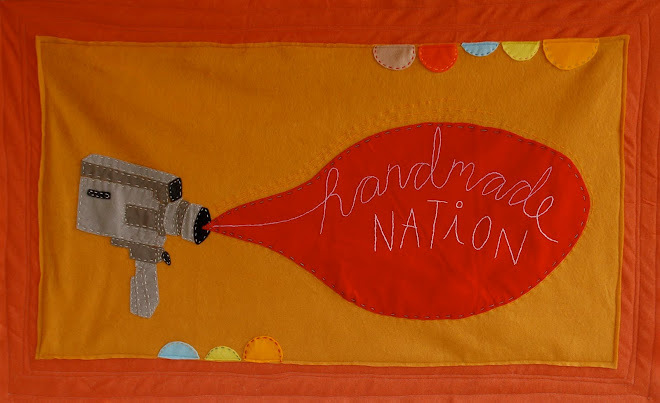 Micaela O'Herlihy is the Director of Photography for Handmade Nation. She is an amazing woman; artist, filmmaker, mother of two. Her son Thurman who is 9 recently had his second art opening and Mark Escribano was there to document it. He shot some fantastic footage and recently put a short up on youtube, if you watch it, make sure you get to the end. Stills I shot from the party are HERE.